Click the blue "Join your team" button in the invitation email. 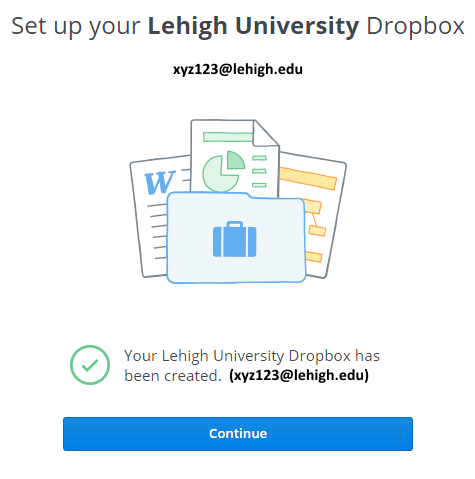 If you previously registered for a Dropbox account using your Lehigh email address, you will need to designate a different personal email address for that account. 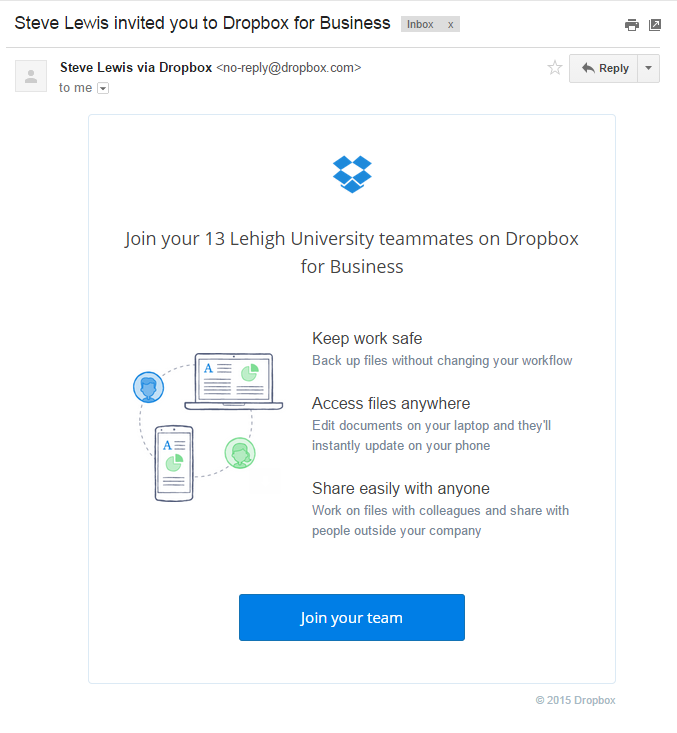 Your Lehigh email address will become permanently associated with your new Lehigh Dropbox account. 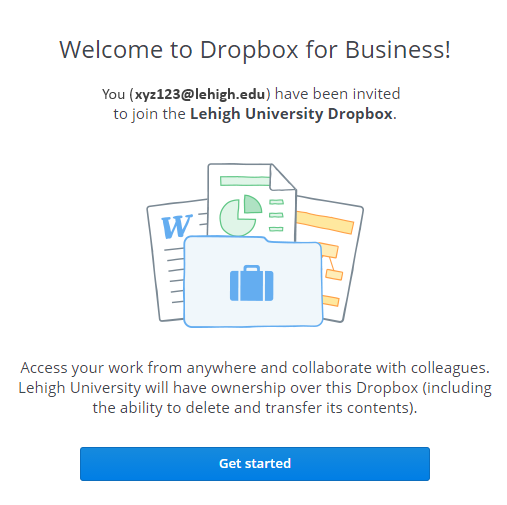 On the Welcome to Dropbox page, click the "Get started" button to proceed. 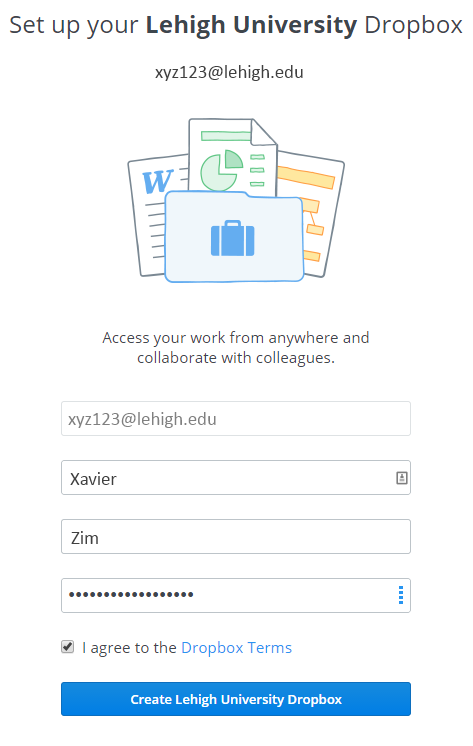 On the account setup page, enter your name and a password for your Lehigh Dropbox account. This password WILL NOT CHANGE when you update your Lehigh password. 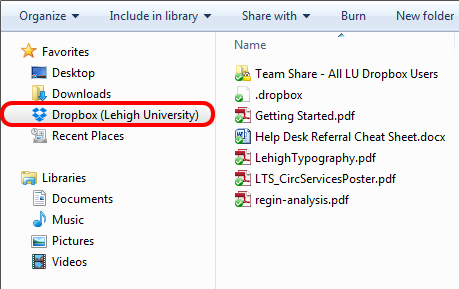 It should be at least 12 characters long, and different from your regular Lehigh password. 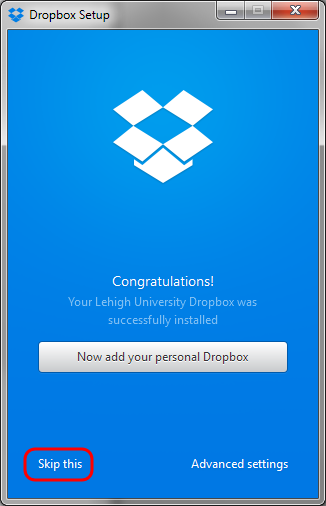 A confirmation screen will appear, verifying that your Lehigh Dropbox account has been created. Click the "Continue" button to proceed. 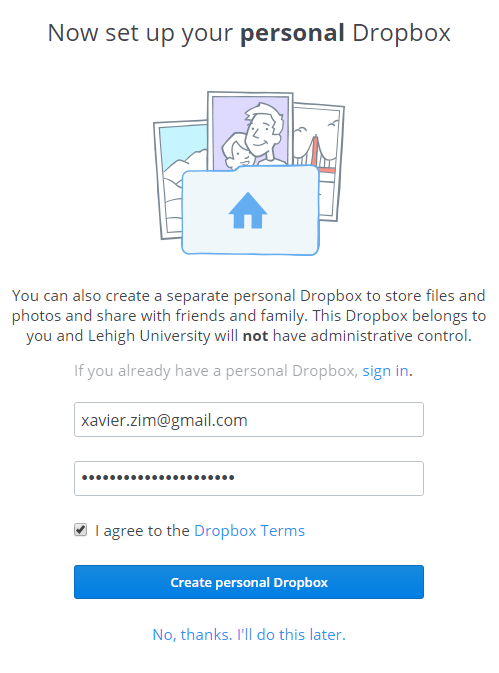 At this point you can create a personal Dropbox account, or log in to a pre-existing account by following the "sign in" link. 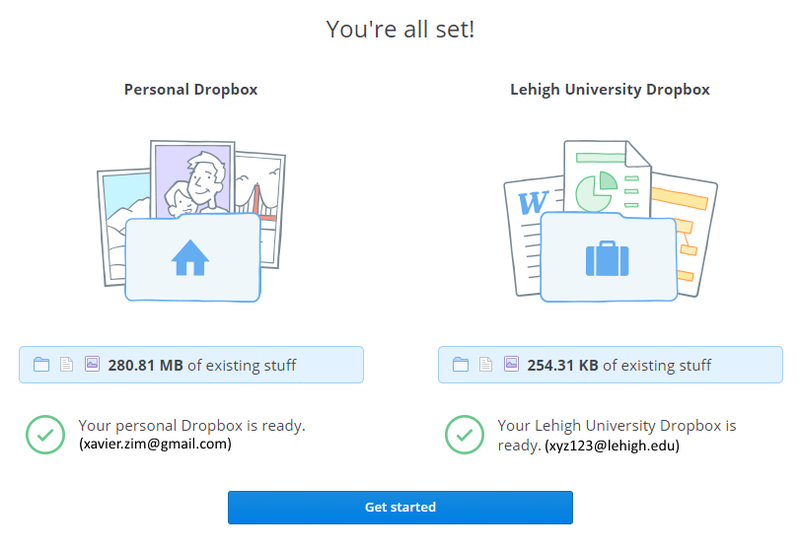 Another confirmation screen will appear, showing you the Personal Dropbox and Lehigh Dropbox accounts, as well as how much space is in use by each. Click the "Get started" button to continue. 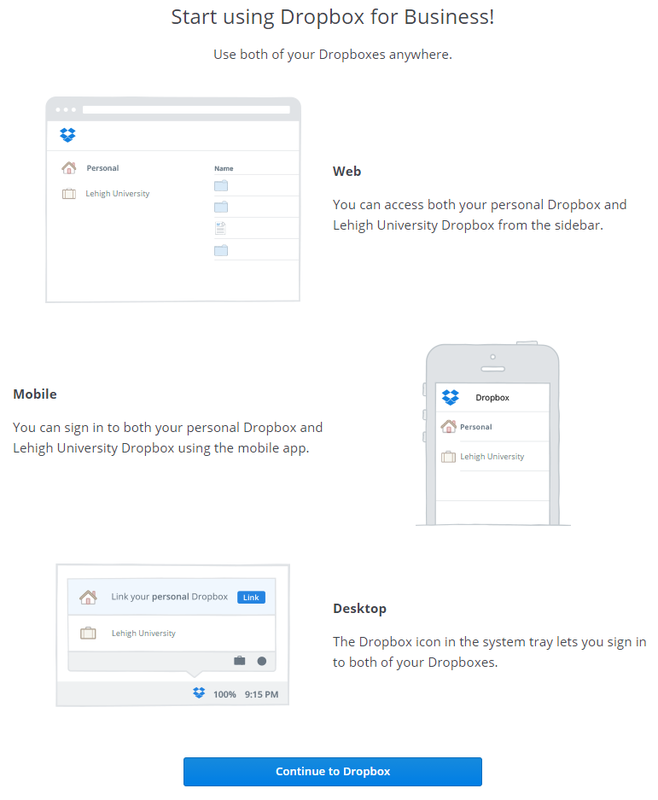 A page will appear, describing the three methods for accessing your DropBox space: web, mobile app, or desktop app. We'll go over installing the Desktop app in a moment. Click the "Continue to Dropbox" button at the bottom of the page. 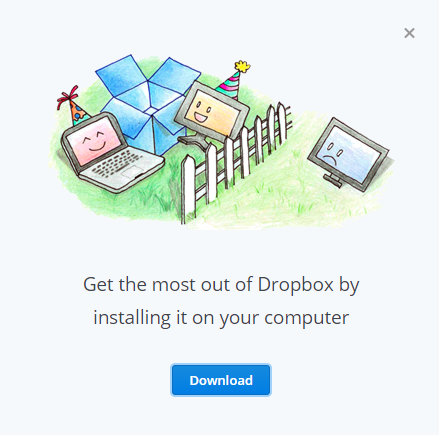 You'll be taken to the web interface for your Dropbox accounts, and a pop up window will appear, prompting you to download the DropBox application for your desktop computer. Click the blue "Download" button to download the app, or if the popup window does not appear, go to https://www.dropbox.com/downloading?src=index to download. Double-click on the DropboxInstaller.exe to install the DropBox tray icon on your system. 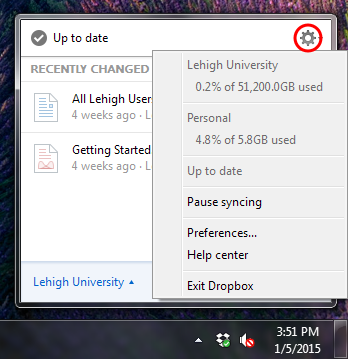 Follow the on-screen prompts to complete the installation and log in with your Lehigh DropBox account. Use the email address and password you specified in Step 3. Then click the "Sign In" button. If you don't have a Personal account, or don't wish to use it at work, click the "Skip this" link outlined in red in the screenshot. Otherwise, click the button to add your personal account, and log in with those credentials. Both accounts will be available in the Dropbox menu in the System Tray (near the clock). Clicking on the icon will open a menu, showing you all the files you have interacted with on Dropbox recently. You can quickly switch between the Lehigh, Personal, and Everything view by using the icons in the lower right corner of the menu. The house icon shows you Personal, the briefcase icon shows you Lehigh, and the Globe icon shows you both. 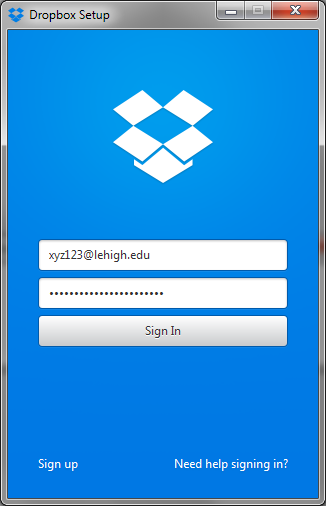 You can also access the files on Dropbox by opening your Computer in Windows Explorer. The folder will be listed under Favorites on the left-hand side of the Windows Explorer screen. Files placed or saved here will be automatically uploaded to Dropbox, and files that are deleted from here will automatically be removed from Dropbox. Dropbox refers to this as "syncing" the folders, that is, keeping all changes synchronized between the local and remote versions. If you wish to quickly see how much space you are using in your accounts, or to access the DropBox preferences, click the gear icon in the upper right corner of the menu. For further discussion of preferences and advanced sharing features of DropBox, please consult the DropBox for Business Users' Guide.